It is the 25th century. Many generations have passed since humanity made its escape to the stars. Yet despite years of exploration at the far reaches of the galaxy, no other signs of intelligent life have been found. While searching the archives of Old Earth, you discover something strange. All infor­mation on a planet called Artemia seems to have been wiped from official records and charts. Intrigued, you mount an expedition to investigate. Preliminary scans of Artemia suggest a CLASS-M planet, home to a wide range of flora and fauna and capable of sustaining human life. 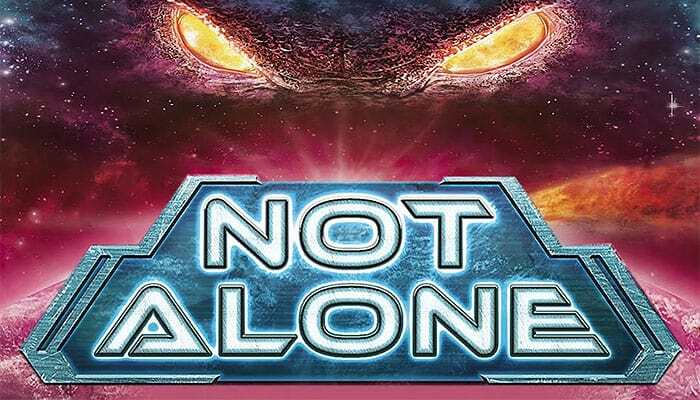 Not Alone is an asymmetrical card game, with one player (the Creature) playing against the other players (the Hunted). If you play as one of the Hunted, you explore Artemia using Place cards. By playing these and your Survival cards, your aim is to avoid being hunted down by the Creature until help arrives. If you play as the Creature, your aim is to hunt down the shipwrecked survivors and assimilate them into the planet's ecosystem. By playing your Hunt cards and activating the powers of Artemia, you repeatedly attack the Hunted to wear down their will and inescapably bind them to the planet. 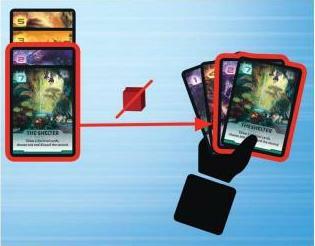 The player playing the Crea­ture puts the board in the center of the table 1, which­ ever way up he likes. Place the Rescue counter 2 and Assimilation counter 3 on the fig­ ure that corresponds to the player count. Place one of each of the 10 Place cards in front of the Creature in 2 rows of each 5 cards, in ascending order 4. Together they form the planet Artemia. Two place cards are adjacent if they have a common border, horizontal or vertical. Place the Marker counter next to the Beach card 5. Form the reserve with the Place cards numbered 6 to 10. Using the table below, place the cor­rect number of each Place card near the board 6, face up. Unused cards are removed from the game. Shuffle the Survival cards 7 and place them, face down, near to the Hunted. Shuffle the Hunt cards 8 and place them, face down, near to the Creature. The player playing the Creature draws 3 Hunt cards and takes the 3 Hunt tokens 9. Each player playing one of the Hunted takes 3 Will counters and a set of 5 Place cards numbered from 1 to 5. Unused cards are removed from the game. Each of the Hunted draws a Survival card 10. The planet Artemia is made up of 10 different Place cards. Each Place card has a number, a name and a power that can be activat­ed by the Hunted. The place cards are horizontally or vertically adjacent. 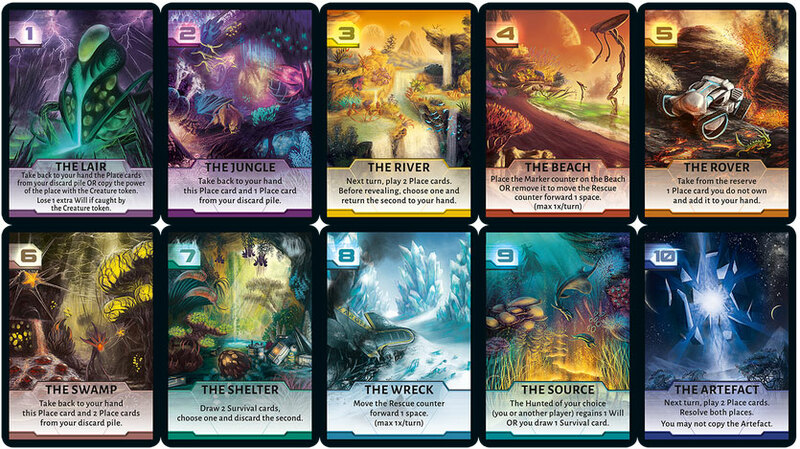 Each Hunted begins the game with the 5 basic Place cards (LAIR, Jungle, River, Beach and Rover) and may explore new places during the game (SWAMP, Shelter, Wreck, Source and Artefact). Hunt cards increase the chances of the Creature of assimilating the Hunted. Each Hunt card shows a power that can be activated by the Creature and the phase in which that power may be played. Some also show a Target or Artemia symbol. Hunt Cards may be played at any time during the phase shown on the card and are discarded after use. The Creature may only play one Hunt card per turn unless specified otherwise. 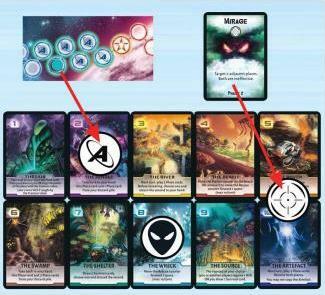 If a Hunt card with the Target symbol is played, the Creature assigns its effects by placing the Target token on one of the 10 Place cards that form the planet. If the Creature plays 2 Hunt cards with this symbol during a turn, apply both effects to the targeted place. 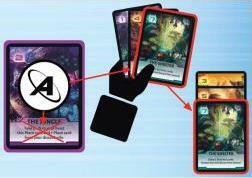 If a Hunt card with the Artemia symbol is played, the Creature assigns its effects toy placing the Artemia token on one of the 10 Place cards that form the plan­ et. If the Creature plays 2 Hunt cards with this symbol during a turn, apply both effects. Survival cards increase the chances of the Hunted of resisting the Creature's attacks until the arrival of the Rescue mission. Each Sur­ vival card shows a power that can be activated by the Hunted and the phase in which that power may be played. 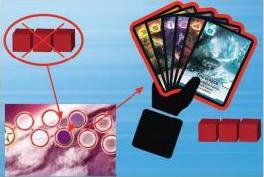 Survival cards may be played at any time during the phase shown on the card and are discarded after use. Each Hunted may only play one Survival card per turn even if caught by the Creature. There is no limit to the number of Survival cards that a Hunted may hold. Hunt and Survival cards used during the same phase take effect in the order in which they are played. In the event of a disagreement, the Creature decides the order in which they take effect, as it benefits from knowledge of the planet. The effects of Hunt and Survival cards are limited to the current game turn and they may change the general rules. The Hunted simultaneously play one Place card each from their hand by placing it face down in front of them. They may communicate, but only aloud. Players may bluff, but they may not reveal their cards to each other. Playing a Place card is mandatory. Resist: the player forfeits 1 or 2 Will counters to take back 2 or 4 Place cards of his choice, respectively, from his discard pile. If in doing so a Hunted loses his third Will counter, he must Give Up. Give Up: the player regains all of his Will counters and takes back all of his discarded Place cards. Giving up, however, lets the Creature assimilate the Hunted faster. Each time a Hunted gives up during this phase, immediately move forward the Assimila­tion counter by one space. Example: Trinity only has 2 Place cards in her hand. If she doesn't do anything about it, the Crea­ ture will probably catch her, because her next move is predictable. Trinity therefore decides to Resist: she loses 1 Will counter to take back 2 Place cards from her discard pile. Tip: When playing as one of the Hunted you must manage your Place cards effectively and make sure that you always have enough in hand, so that the Creature cannot deduce the next place you will explore. The Target token if the target symbol is on a Hunt card played. 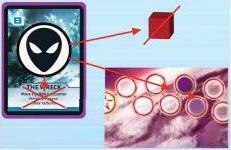 The Artemia token if the Artemia Symbol is on a Hunt card played AND/OR on the space under the Rescue counter. The Hunt tokens can be placed on the same place to stack their effects. Example: Ghislain starts by putting the Creature token on the Wreck. Since the Rescue marker is on a space with the Artemia Symbol, he can also place the Artemia token, which he drops on the Jungle. Finally Ghislain decides to play the Hunt card "Mirage", which cancels the effects of 2 adjacent Place cards. He puts the Target token on both the Rover and the Artefact. Tip: When playing as the Creature you must pay close attention to Place cards discarded by the Hunted in order to deduce the places they might explore next. Remember that the Hunted all begin the game with the same Place cards in hand. Starting with the player to the left of the Creature, each Hunted who explores a □ ^place without a Hunt token may immediately use the place's power OR take back 1 Place card of his choice from his discard pile. If a place's power is ineffective as a result of a Hunt card, the Hunted may not take back a discarded Place card. Each Hunted who explores the place where the Target token is located is subjected to the effect of the Hunt card. He may then use the power on the Place card OR take back 1 Place card of his choice from his discard pile. If a place's power is ineffective as a result of a Hunt card, the Hunted may not take back a discarded Place card. Each Hunted who explores the place where the Artemia token is located discards ll Place card from his hand. The place's power may not be used and the Hunted may not take back a discarded Place card. Each Hunted who explores the place where the Creature token is located loses 1 Will counter. Immediately move the Assimilation counter forward 1 space regardless of the number of Hunted caught. The place's power may not be used and the Hunted maynot take back a discarded Place card. 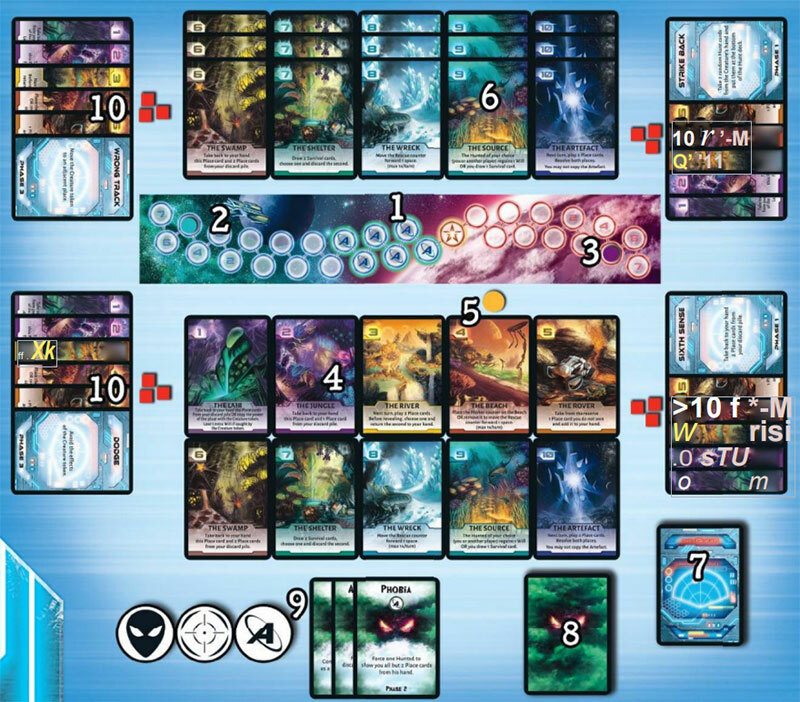 During this phase, if at least one of the Hunted loses his third Will counter, move the Assimilation counter forward by 1 space. Then these Hunted take back all of their Place cards, as well as their 3 Will counters. Example: Rick reveals the Lair card: none of the Hunt tokens were placed on the Lair. Rick decides to copy the effect of the Wreck (the place where the Creature token was dropped) and immedi­ ately advances the Rescue counter by 1 space. Freddy reveals the Rover card: nothing hap­ pens, because the Rover was targeted by the Hunt card "Mirage", which disables the effect. Freddy may not take back a Place card from his discard pile because the place is ineffective. Trinity reveals the Jungle card: because of the Artemia token, Trinity cannot use the ef­ fect of the Jungle, and also has to discard a Place card from her hand. 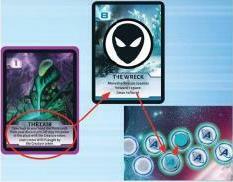 Malcolm and Ripley reveal the Wreck card: because of the Creature token, they cannot play the effect of the Wreck. Addition­ ally, they each lose IWILL counter, and the As­similation counter moves forward by 1 space. The Will counter Ripley lost was her third and last. The Assimilation counter there­ fore advances an extra space. Ripley then gets back all her Place cards and 3 Will counters. Each Hunted discards the Place card played, face up. The Creature must always be able to see the figures on all discarded Place cards. The Creature takes back its Hunt tokens and draws Hunt cards up to a hand of 3. Move the Rescue counter forward 1 space and begin again at Phase 1: Exploration. The Creature wins immediately if the Assimilation counter reaches the Victory space first. With their will sapped, all of the Hunted have been assimilated. They are now part of the planet. The Hunted win immediately if the Rescue counter reaches the Victory space first. A rescue mission arrives to extract the survivors from this hostile planet. The Lair: if a Hunted chooses to retrieve his discarded Place cards, he does not retrieve the Lair because during the Reckoning phase, the Lair is not yet in the player's discarded cards. The Beach: use of the Beach is limited to once per turn regardless of the number of Hunted explor­ing the Beach: either charge the Marker (place the Marker token on the Beach), or activate the Mark­ er (remove the Marker token from the Beach and move the Rescue counter forward by 1 space). If two or more Hunted explore the Beach, one of them may use the power of the Beach and the others may take back 1 Place card of their choice from their discard pile. The power of the Beach may stack with that of the Wreck. The Wreck: use of the Wreck is limited to once per turn regardless of the number of Hunted ex­ ploring the Wreck. If two or more Hunted explore the Wreck, one of them may use the power of the Wreck and the others may take back 1 Place card of their choice from their discard pile. The power of the Wreck may stack with that of the Beach. The Artefact: the 2 Place cards played are resolved one by one in the order of the player's choice, following the rules of Phase 3: Reckoning. When a Hunted reveals his Place card(s), if he may use both the power of the River and the Artefact during the same turn, he must choose one of them. Then he may take back 1 place card from his discard pile. The power of the Artefact may not be copied by a place's power, nor by a Survival card. The Shelter and the Source: if the Survival draw pile is empty, shuffle the discarded Survival cards to form a new stack.